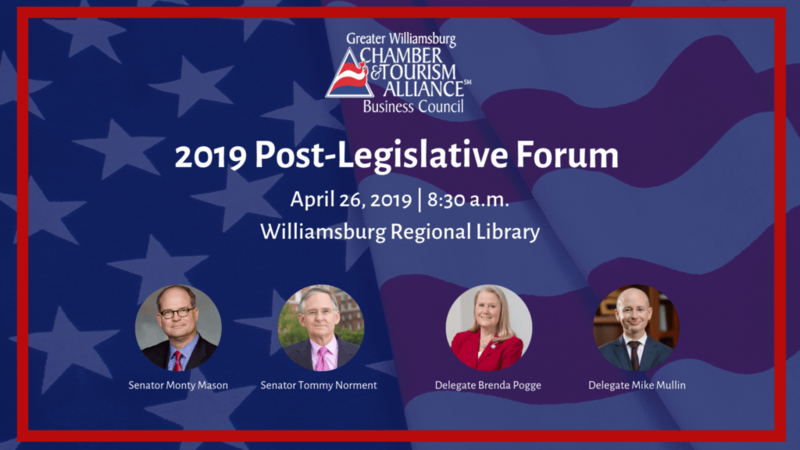 Come out and hear from your local representatives, Senators Tommy Norment and Monty Mason along with Delegates Brenda Pogge and Mike Mullin, about the legislature that was passed in the recent General Assembly session. Coffee and networking will start at 8:30 a.m. on April 26 followed by the forum and a Q & A session at 9 a.m. The event is free and open to the public, so be sure to register today and we’ll see you at the Williamsburg Library! Previous Post The April 2019 newsletter is here, & we’ve been busy!